A USB microscope uses a camera take a image that you would normally see through the eyepiece and shows it on your Windows or Mac computer. The first USB microscope products were very little more than toys. They were interesting, but the pictures were grainy and barely acceptable for personal use. 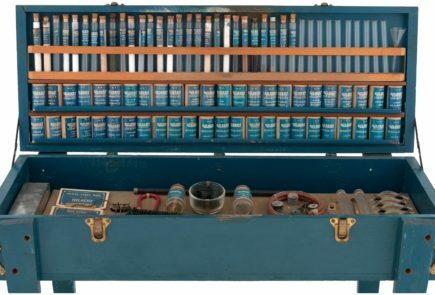 For many years, they were most useful for circuit board work and encouraging a child’s interest in science. Technology has come a long way since those early days. You still have to be careful to avoid cheap Chinese junk, but relatively inexpensive options are now used for education and lab work. Of course, devices compatible with Windows, Mac, and Android will be our focus. When buying a USB digital microscope, avoid plastic optics! These are the best available, with high-precision optics, ranging from cheap educational options to binocular laboratory grade models. The product that is right for you will depend on your budget and how important being handheld is for your use. 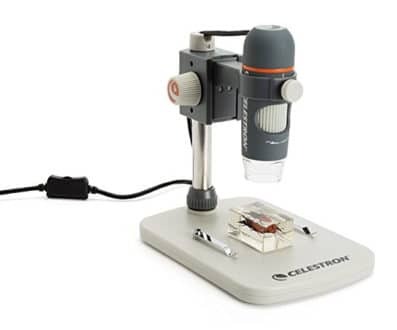 An entry level microscope is ideal for encouraging a child’s interest in science and should be considered to be as essential and basic as chemistry sets and kits. Giving a child the opportunity to see the world up close, to learn, and instilling that there is more going on than just what can be seen with the naked eye, can fuel a love for science that will last a lifetime. Though perfect for young scientists, each product is also a good choice for personal use or seeing the details of electronics. With a 5 megapixel camera, this is one of the easier to use starter microscope. You can use the traditional stand, for a vibration-free image, or you can detach the stand and use it as a magnifier. Because the focal length is set, the software can actually take detailed measurements of the objects that you are viewing. The Celestron can also be handheld and portable, which can be detached from the stand to make it easy to view hard to reach, or immovable, objects in great detail. This is an advantage that more expensive models lack. From an educational perspective, neither of the above benefits should be overlooked. There are many things that will not fit on a microscope slide. However, image details are significantly lacking in comparison to the more expensive models below. You can only get so much at a price under $100, and this is our only real complaint. The Opti-Tekscope is in the same price range and has similar features. It too is more basic, but there are some things that are different. The key advantage is that it is more flexible, so it can be used as a handheld endoscope or digital magnifier. 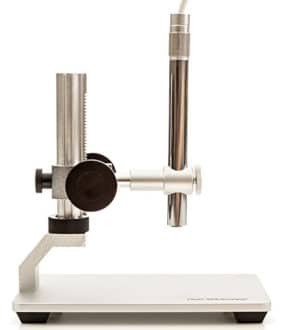 This new microscope can be used as a handheld, and it is a much more sturdy product, with aluminum construction and height adjustments. The primary advantage of the Opti-Tekscope offers is that it can record video rather than simply taking still pictures. For anyone with a lasting interest in science, a binocular eyepiece offers better results and enough features to justify a higher price. These products offer significant advantages like much better construction of optical components, more powerful magnifier, and laboratory grade construction. Unlike the lower priced options, with a binocular microscope you can actually look through in addition to having a camera. You are not limited to only viewing a picture on your screen. Because of the high magnification, you can see truly microscopic details. For example, you can clearly see bacteria and watch them swim in a drop of tap water, or view cells in plant samples in incredible detail. In a blood sample, you can actually see red blood cells in the image. 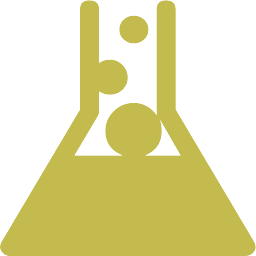 AmScope is a well-known name, with a feature list that makes the budget options seem more like toys. For under $300, it is a professional digital microscope at a hobbyist price point. Interestingly, it is limited to only 1.3 Megapixels but you can see much finer details because the limiting factor for the technology is the lenses, not the camera being used. Being primarily intended for back-lit samples, anything transparent or semi-transparent gives the most detailed results with the camera. For solid objects, be prepared to provide significant light in addition to its built-in LED due to the high magnifications. 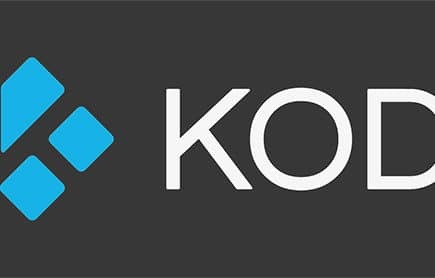 Software for Windows or Mac is included, which will support streaming video or images from your computer to the web. Different resolutions for images and video can be set simultaneously with the software. This is an excellent compound microscope, with eyepiece, making it perfect for personal or lab use, regardless of experience. This list is short for a reason. These are the only USB microscopes we would own. The two entry level models are the best options within a pretty wide price range, but which one of the two is right for you depends on your personal needs, and how important an endoscope is for you. The AmScope is the only high quality USB 2.0 digital microscope currently on the market. Some products appear better at first, usually because of the camera, but the problem is that the details of the images are inferior because they can not be used for the full magnification range. A 3 megapixel USB camera is not an improvement if it can only image at 100x magnification power on your computer. 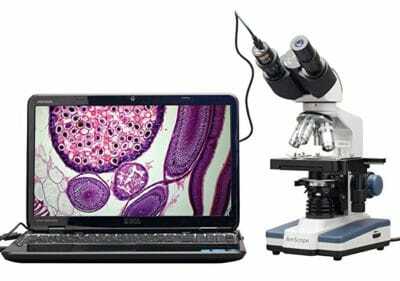 This places the AmScope, which can image across its full range of magnification, as the best USB microscope with a price under $1,000. Ukrainian born, and a self-taught geek. I started hacking when I was 14 and can write code in 5 languages, but have no formal technical education. The edge of technology is what keeps me interested. I cover file sharing, the dark web, and certain gadgets for The High Tech Society.